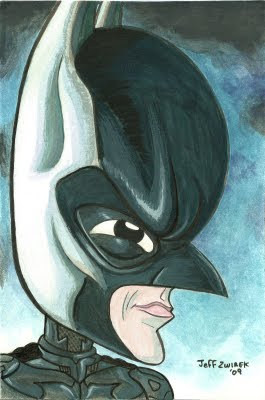 Here's another portrait, of the gravel voiced Batman from the Dark Knight, as played by the gravel voiced Christian Bale. This and a couple of other new pieces are going to be available to purchase at the Chicago Comic Con, next weekend. It used to be called Wizard World, down at the old Donald E. Stephens Convention Center, but they changed the name for some reason. I'll be in the Artist Alley, hocking my wares, including a bunch of portraits, and as always comics. I'll be posting the other new portraits here in the next couple of days so check back. Tomorrow, The Joker as played by Heath Ledger. Yay! I will come stop by your table for a visit! Might have my nephew with me on Friday for his first-ever convention experience. Cool! Look forward to seeing you guys there.